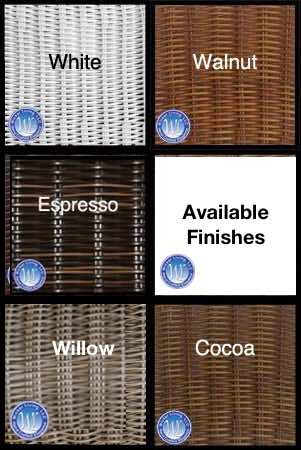 Quality resin is woven onto the song aluminum frames to form an exceptional set. The standard rocker is one of the smoothest and well balanced wicker rockers available. The rocker comes with a tufted seat cushion. Deep seating chair and love seat use solid foam seat cushions and fiber filled back cushions. All deep seating cushions have zippered removable covers and the backs have casing inserts that hold the fiber when the cover is removed. Note: The image used for this wicker set includes other pieces not offered in this four piece set.